Four-color process printed on both sides of 14pt C2S White Semi-Gloss stock coated with Bio-Plus UV. 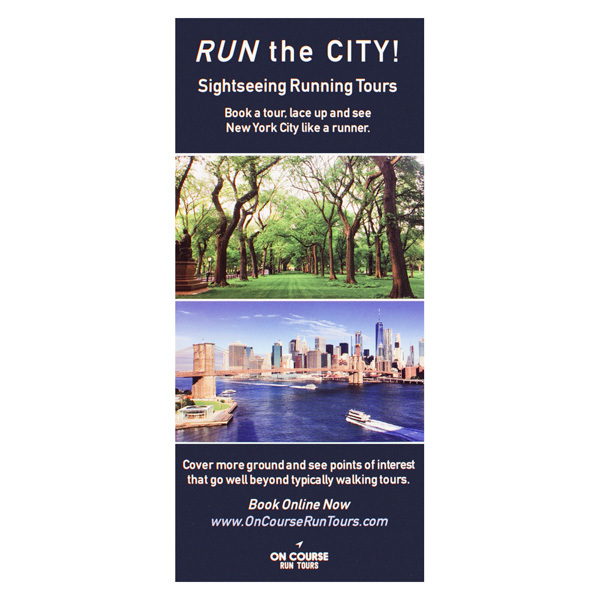 Some of the sights customers will see on their tours with On Course Run Tours are pictured on the front and back of this rack card. The sans serif font makes it easy to read, while the blue and white color scheme evoke feelings of security. A touch of yellow is on the back to make those facts stand out and get customers excited about their tours. Four-color process printed on both sides of 14pt C2S White Semi-Gloss stock. Side 1 coated with Bio-Plus UV. 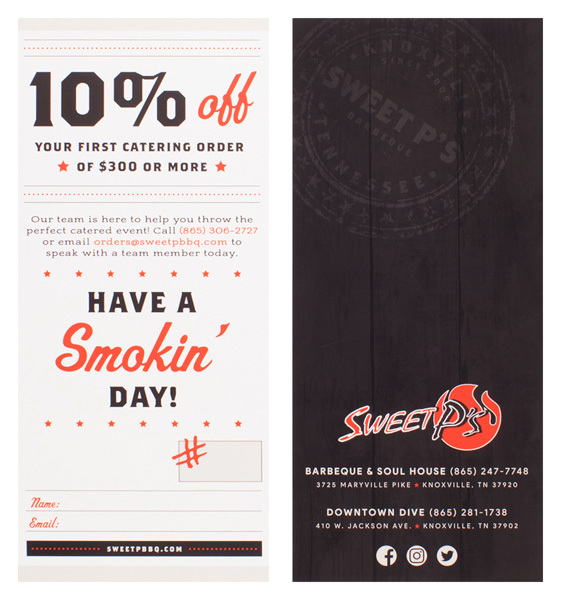 This design features a smokin' barbecue theme with a black, red and white color scheme. Discount information is on the front alongside a friendly message. Restaurant contact information is on the back along with the logo, which features a flame. A branding stamp is also on the back, mimicking branding that would be used on meat. Four-color process printed on both sides of 14pt C2S White Semi-Gloss stock. Coated with Bio-Plus UV Flood Gloss. This rack card design from Cantey Foundation Specialists takes a highly personal approach, with an informative, heartfelt message directly from one of their employees. 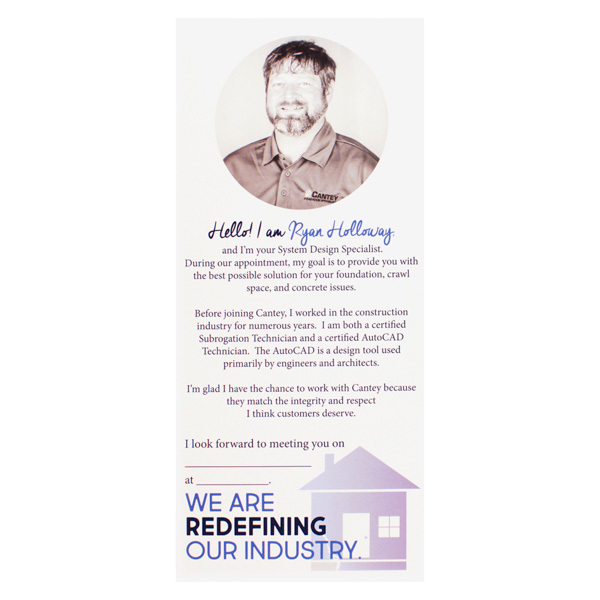 Both the front and back of the card features detailed information about Ryan Holloway (including qualifications and personal interests), to build a deep connection with the recipient. There's also a testimonial from one of his clients, demonstrating the company's commitment to customer satisfaction. 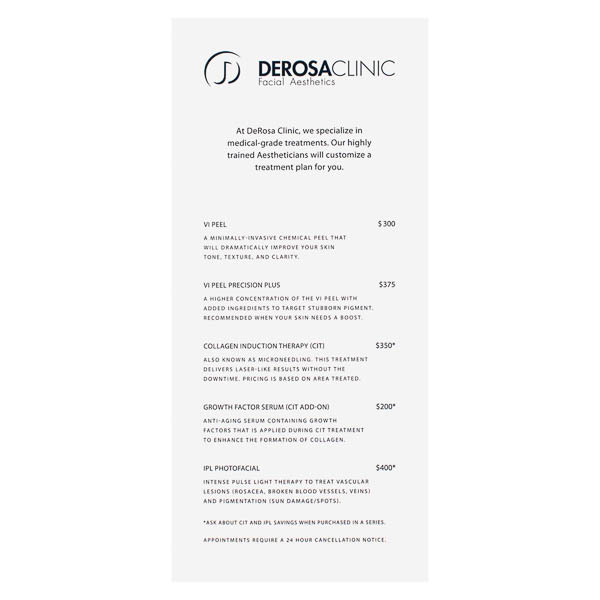 Black sans serif lettering on a white background creates a modern style for DeRosa Clinic Facial Aesthetics. Its front panel lists treatments and prices. On the back, clients can read about more treatments or contact the clinic, whose information is listed along the bottom of the panel. Designed for literature racks, this 4" x 9" item is slender enough to fit into the palm of the reader's hand, yet large enough to hold their attention. Its use of four-color process printing means that high-resolution photos and intricate graphics come off the press looking crisp and clear. Both sides of the product can be customized with brand information, logos, product lists, or other descriptive writing to let potential clients know who you are and what you do.